At Ministry of Testing we have been putting our efforts into growing up. Part of growing up means doing things a bit more professionally and responsibly. It means making plans for the future. It means taking risks and making investments. It means growing our team and our wonderful testing community. And it means that we also make new shiny things! But first…we’ve come a long way! It’s easy to forget our humbling beginnings. I mean, to prove it, I just had to dig out some old logos and design stuff. We started out as The Software Testing Club. This was the online community that I started in 2007. For a laugh, look at how our STC logo evolved. ! And here are some of our monsters. As you can see, some didn’t quite make the journey. Whilst others got some facelifts. In 2011 I felt the need to create a separate project from STC to focus in on the mission of what has become Ministry of Testing. For me personally I was just a bit tired of working for free and I wanted to see if I could make a living doing something that I believe the software testing community needed. 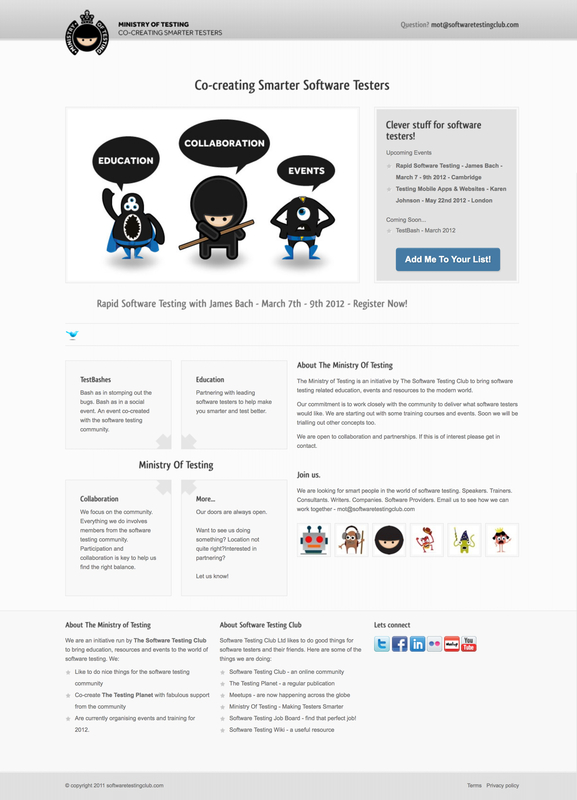 The first Ministry of Testing website was something I put together using HTML and CSS. I found a template I liked and put things together. Interestingly, the focus and our mission hasn’t really changed since it started. We then moved onto a WordPress platform. 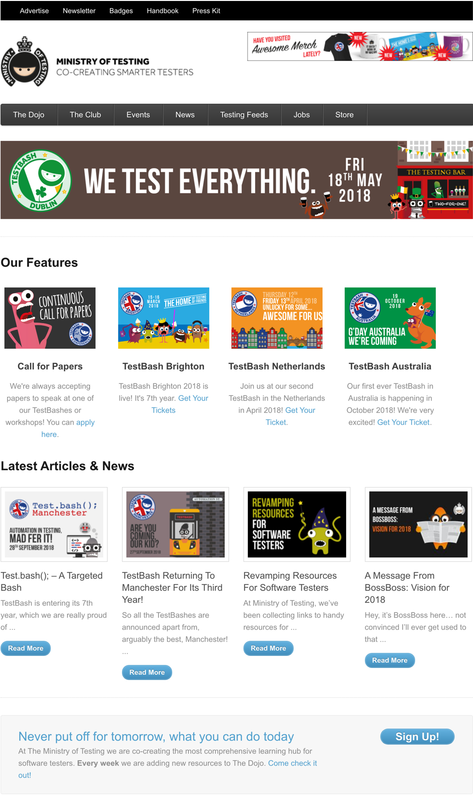 This is what you’ve seen as the front MoT page, our jobs board, our much loved Testing Feeds and many content pages. It looked something like this. Next on our list of projects was creating The Dojo. I remember The Dojo launching when I was pregnant with Eloise - this is how I remember things these days, by relating them back to my children! That means it’s been 3.5 years of The Dojo existing and growing. We have built The Dojo from scratch, it has all been custom built according to our needs…and resources. It’s been a project that we have been committed to grow consistently and with a long term view. We knew we would out grow our WordPress platform, and it was far from ideal having it run along side The Dojo. It has just been a bit of a mammoth task to do so whilst managing all the things we have going on. On top of this, we also ditched our old Software Testing Club forum and started it afresh with The Club, now merged into the MoT brand. We decided to just ditch all the content and start a completely new forum scratch. This was quite scary, for me in particular, at the time. It’s easy to become attached to stuff and feel like there is much value in all the old forum discussions. But starting things from scratch has been a blessing and The Club has continued to grow, rather than stagnate and decline as it was with the old software we were using. We now use Discourse for The Club. It is amazing (especially in comparison to the old STC which used a clunky and hosted platform called Ning). We now have a fancy and shiny new website! Yesterday we flicked the switch! And in its place is shiny new things! And then I get the pleasure to write about it all. Nice one Rosie. NOW GO VISIT THE NEW MINISTRY OF TESTING WEBSITE. PS. This is the first step in our new phase of commitment and growth to the community. We welcome your feedback (and bug reports). Now that it is live you can expect to see updates on a much more regular basis.